Farmington Hills, Mich. — The American Concrete Institute (ACI) announced the winners of the 2017 Excellence in Concrete Construction Awards, who were honored during the Institute’s Concrete Convention & Exposition, October 16, 2017 in Anaheim, Calif. 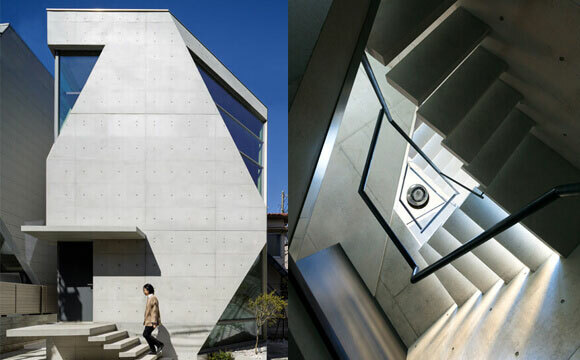 This house is in the center of Tokyo, sitting on an area of 66 m2 (710 ft2). The clients are a married couple, sharing a passion for architecture and art. When they found a rare corner lot of land in central Tokyo, they knew they wanted to build a home with unique materials and construction methods. In high-density residential districts, one way to architecturally build is towards the sky — creating a high-level insulated audiovisual room respecting nature and the environment. It is the only direction that captures the feeling of the vastness of nature. The project team has studied this approach towards the sky as an element of nature for many years, and for this project they pruned away the corner of a rectangular volume to achieve this. For architecture on a small site, sectional and volumetric design becomes very important. Cutting away the internal volume paradoxically creates a sense of spaciousness in the continuous four-story space inside. Large openings facing the sky are effective means to incorporate the feeling of vastness into the internal space. The chamfered corners not only provide a view to the sky from the internal space, but also for the people outside. There is a high-level, sound-insulated audiovisual room in the basement, and a spacious gallery and a Japanese room on the first floor. Functionality was prioritized on the second floor with a living room, dining room, kitchen, and bathroom. The living room is a very small space, but a 5-meter-high ceiling and a large oblique triangular window — drawing in an abundance of external light — results in a cognition of spaciousness that is far greater than the actual space in terms of footage. The final design of this space was derived through a vast number of three-dimensional models. The ACI Excellence in Concrete Construction Awards were created to honor the visions of the most creative projects in the concrete industry, while providing a platform to recognize concrete innovation, technology, and excellence across the globe. To be eligible for participation in the Excellence Awards, projects needed to be winners at a local ACI Chapter level and submitted by that Chapter, or chosen by one of ACI’s International Partners. 1st Place: Market Street Parking Garage Restoration, in Wichita, Kan.
1st Place: R·torso·C, in Tokyo, Japan. 1st Place: Johnson County Gateway in Overland Park, Kan.
2nd Place: Winona Bridge, Winona, Minn. The winning project details can be found at www.concrete.org. Entries for the 2018 Excellence in Concrete Construction Awards are being accepted now through April 2, 2018. Visit www.ACIExcellence.org for more information.